"That was the worst year of my life. And I got drafted to the NHL and achieved my dreams," Carcillo, a third-round pick of the Pittsburgh Penguins in the 2003 draft, said in a phone interview with The Canadian Press on Monday. "So think about that statement. "That was, by far, the hardest year of my life. No doubt about it." Carcillo, 33, was inspired to open up about his experience after news broke about an alleged sexual assault involving athletes at St. Michael's College School, an all-boys private school in Toronto, that was captured on camera. The native of King City, Ont., also thought it would be helpful to share his story as part of Twitter's Bullying Awareness Week. From his verified Twitter account, Carcillo spoke of being beaten with the sawed off paddle of a goaltender's hockey stick on a daily basis. He also described a "shower train" where rookies were forced to sit on the floor in the shower as veterans urinated or spit chewing tobacco on or near them, sometimes throwing shaving cream at them as well. "There's no stopping me (sharing these stories). 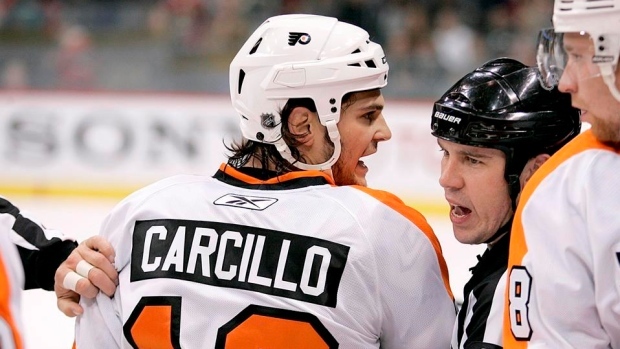 This sport and that culture has taken a lot from me," said Carcillo, who was a plaintiff in a class action lawsuit against the NHL over the league's handling of head injuries. A tentative US$18.9-million settlement in that lawsuit was announced on Nov. 12. "I just want to make sure that people understand these uncomfortable truths. That parents understand what really goes on and that it happens way more often than just me talking about it." During that season, Carcillo contacted David Branch, commissioner of the OHL, telling him of the ongoing issues in the Sting's locker-room. Branch was not available for comment on Monday, but a spokesperson from the league said that Branch brought the issue to the attention of Sarnia's ownership and management groups and began initiating harsh fines and penalties for teams that were caught hazing players. "As acknowledged by Daniel Carcillo in several of his online posts, the OHL did react to the concerns he raised during his rookie season," reads an official statement issued by the OHL to The Canadian Press. "The league, which has a zero tolerance on hazing, has been implementing policies to prevent hazing or bullying for several years. Today in the OHL all players receive training on the prevention of bullying and hazing through their member team. All players acknowledge to the league in writing that they have participated in this training process. Players are encouraged to bring any concerns forward without fear of reprisal." In October 2005, Windsor Spitfires' Moe Mantha was given a one-year suspension as general manager and 25 games as coach for a hazing incident involving several of his players. Then in 2009 the OHL's board of governors developed the OHL Enforcement Program, designed to address and attempt to eliminate violations of the hazing rules and impose appropriate penalties if violations occur. Jeff Perry, Sarnia's head coach in 2002-03, says he was concerned for Carcillo and disappointed in his veteran players when he read Carcillo's allegations this past weekend. "Certainly it's something that, at the time, we were unaware of. It's nothing that the Sarnia Sting or the management group or the coaching staff would support or condone if those allegations were true," said Perry. "Hard to make a formal comment, other than, obviously it's affected Dan, who I think is a great young man, gone on to have a terrific career. "Certainly it's concerning to hear that these events possibly took place." In a story published in the Players' Tribune online magazine on July 1, 2015, former Sting forward Rich Clune — a year younger than Carcillo — alluded to hazing issues in Sarnia when he joined the team for the 2003-2004 season. "This was back in the days when physical hazing was pretty prominent, but luckily one of the older guys on the team, Daniel Carcillo, stuck up for me for some reason and made sure the older guys didn't mess with me too bad," said Clune. "I'll always love him for that." Unrestricted free agent Shawn Matthias tweeted Carcillo's series of posts, saying his experience as a rookie on the OHL's Belleville Bulls left him "an angry confused young man," until he joined the NHL's Winnipeg Jets where he said head coach Paul Maurice and other members of the organization helped him overcome his trauma. Matthias did not immediately respond to an interview request from The Canadian Press and Maurice declined comment. Perry made the point that coaches can't be everywhere and that alleged incidents like the "shower train" that Carcillo described on Twitter can easily happen without the knowledge of coaches. "We can't stand in the shower areas for obvious reasons," said Perry. "There's certain areas in a room where we can't monitor as a staff or watch 24/7. You would certainly hope that your leadership group, your veteran players, wouldn't do the things that are being alleged by Daniel. "You would hope that you would have better character in your room. That's the disappointing fact that if it did take place you would certainly would be disappointed in your veterans." "To be honest, I like Jeff, I really do. I don't blame him. I don't blame him, I don't blame (assistant coach Greg Walters)," said Carcillo. "I blame the guys who did it to me. Straight up. And I always will. "I've moved past this. I've shook their hands at bowling tournaments in Toronto. Part of me wanted to knock them out on the spot and part of me ... fake it until you make it. "I don't want to blow these guys' lives up because some of them are still hanging on in the minors."